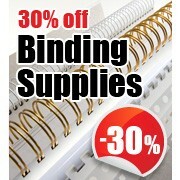 “My experience over the past few years with the Binding Store has been extremely positive. From my initial order for a Renz binding machine to the ongoing ordering of wire binding supplies, the Binding Store has dealt with all my orders both professionally and promptly. Thanks to the Binding Store I have seen a good return on my investment in such a short period of time. “I purchased a binding machine from Russell on Friday. I run a training business and want to create my own wire bound manuals, all very new to me. I looked online and it was very confusing. I called Russell who suggested I come to his showroom and have a look. When I arrived he had 3-4 machines he had set up to show me. He asked me the right questions and helped me identify the best machine for my requirements. Russells knowledge was top draw, he spent time showing me each machine and how they all worked. I was there for an hour. I decided on a RENZ machine which Russell offered to deliver the next day, Saturday morning. Upon arrival Russell set the machine up for me and spent another 45 minutes giving me a full tutorial. I picked up at least 5 things that I would never have known without his advice, this alone was probably worth the money I paid which in my research was very competitive. I have been happily punching and binding all weekend and the machine is exceptional. I have to emphasis that the tips Russell gave me have made a big difference. “Just a short note in thanking Binding Store for all your assistance regarding our new laminating machine. The machine is performing very well with all the various job types we throw at it. For our next investment we would always seek advice and help from Binding Store and would certainly recommend all potential buyers of print finishing equipment to contact you. “I’m writing to thank you in regards to the Renz binding machine we recently purchased. I would like to thank you and your company for your continued support. We use the machine daily and it has never let us down.